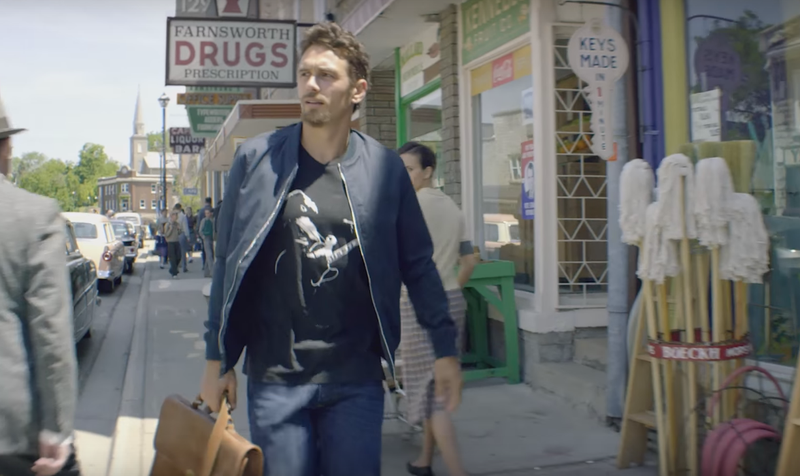 One of the very first scenes of 11.22.63 features a character explaining just what he has been doing with the awesome power of time travel: He’s been buying really good, really cheap meat from 1960 and bringing it back to the present to make hamburgers. No other character ever really manages to top that reason. 11.22.63 is Hulu’s forthcoming adaptation, premiering on Monday, of Stephen King’s sprawling novel of the same name (although different punctuation—11/22/63 is the novel’s title). It tells the story of high-school English teacher Jake Epping, played by James Franco, who’s bequeathed a time travel portal to 1960 by the owner of his favorite diner, an underutilized Chris Cooper. Along with that gift, though, comes an incredible, perhaps impossible, task: Jake must save JFK from being assassinated in 1963 and alter the course of American history. What follows is a steady walk backwards through time that, while missing a few notes, still manages to successfully pull out one of the novel’s freshest takes on time travel. “The book’s always better, everyone knows that,” fellow high school teacher Sadie tells Jake as they talk about their favorite books and movies during their first meeting, both of them just barely managing to avoid winking into the camera as they speak. It’s more than just a nod across the fourth-wall to the audience—it’s a signal that this adaptation intends to treat King’s source material as canon, and something not to be strayed from lightly. That certainly seems to be true. There are little changes here and there—the adaptation has pushed the present day scenes up to 2016 instead of 2011, for instance—but by and large, it’s an extremely faithful adaptation. Yet, while the details are all mostly there, one of the larger strokes of the book is missing—and its absence is the biggest problem the adaptation has. The best part of King’s novel is the way Jake’s biggest antagonist is often not another character—rather, it’s the unwillingness of time itself to be changed. In the book, the past’s pre-set course has a raw, natural power, more akin to that of a storm or a huge wave than any traditional monster; time in this universe isn’t hostile or evil, it’s simply an unmovable force—and watching the book’s characters struggle against something large, powerful, yet ultimately uncaring are some of its best moments. The miniseries’s version of time is both a little more toothless and little meaner. It’s less a storm to fight against, but something more akin to an evil summer camp, with zany but vindictive pranks around every corner. That’s not to say that the miniseries adaptation misses the tone entirely. In fact, although the miniseries misses out on the book’s ominous notes, it does manage to pick up admirably on an entirely opposite facet on the book: It makes the past look fun. We’ll leave the specific details for you to discover yourself, but as things unfold it becomes clearer and clearer that the real reason Jake wants to travel in time is not really to course-correct the past, but rather to live in it. And no wonder—the fact is that his life in 1962 is noticeably better than his life in 2016. In 2016, Jake can barely force his bored students to put down their phones in class; their ‘60s counterparts literally surround him in a circle and cheer while he shows off his swing-dancing moves. He practically chortles with glee anytime he reads a 1962 price on anything. But the biggest shift is in how he sees himself. “I know more than people know here yet,” he announces to his girlfriend at one point, with not a trace of irony. The space between what he does and doesn’t know, though, is where 11.22.63 makes its most interesting verdict on time-travel. Despite his frequent, noisy announcements to the contrary, Jake’s ability to alter time does not seem very promising. He’s a clumsy and half-hearted spy who, even with the help of bugs and listening-devices, can never really seem to keep tabs on Lee Harvey Oswald; he’s not a well-researched historian (his prior research seems mostly to have consisted of a single Google Image search and a couple Xeroxes of old newspaper clippings); he’s not even a good enough planner to have realized that an iPhone is not a particularly useful carry-on when traveling to 1960. But, in King’s universe, where time is neither particularly fragile nor malleable, that’s no great flaw. Jake is really just a guy who realizes that he likes his life better five decades prior. And—as you watch him alternately stumble his way into the broader strokes of history, while simultaneously settling comfortably into the smaller fabric of his new ‘60s life—you can’t help but think that he’d be better off if he’d just followed his mentor’s early example and time-traveled for the sake of the hamburgers alone.